The process of acquiring shops and other businesses in Wood Street proved to be more difficult, but was completed early in 1937, when the very last shop, C Pascos at number 15, closed. The Education Department, under the guise of a general re-organisation of schools in the city, agreed to make Wood Street schools redundant. From the start of the school year in 1937 there was a steady fall in the number of pupils. The infants’ school closed in August 1938, the girls’ school a year later. More information about the last two years of life at the girls’ school and the infants’ school can be gained from the school log books, now held at Glamorgan Archives. The head teacher of the infants’ school, Margaret Landreth, left in February 1937, and the head teacher of the girls’ school, Florence Bridgeman, departed in August that year. At both schools a small number of more junior teaching staff were left to see out the last couple of years. The Congregational church was left untouched as it was outside the area needed for redevelopment, but the Corporation attempted to enter discussions with the diocese of Llandaff with a view to the acquisition and closure of St Dyfrig’s church. The church authorities succeeded in using various stalling tactics, and at the time when the general demolition was about to start no agreement had been reached. The church was allowed to remain standing for the time being. By November 1937 all residents living south of Wood Street had moved away, and demolition had begun. A number of sub-tenants still occupying houses north of Wood Street had to be evicted. The Hooper family at 6 Park Street were expecially reluctant to move. Mr Hooper, who had lived in Temperance Town all his life, was a master craftsman producing watches and jewellery. As he supplied his goods to shopkeepers in the centre of Cardiff he applied to the council for compensation for the disturbance of his business. However, the minutes of the Wood Street Area Improvement Sub-Committee of 21 February 1938 reveal that he was advised to accept the recommended settlement, and the Hooper family moved to the suburb of Canton. The area north of Wood Street was cleared by May 1938. By then the threat of war had begun to loom. The proceedings of the various council committees make it clear that planning of the new developments gradually wound down, until in October 1939, after the outbreak of war, the Wood Street Area Improvement Sub-Committee had to decide to put the whole project on hold. Near the end there was talk about still going ahead with the underground car park, adapting it for use as a gas-proof shelter, but soon it was clear that even that part of the scheme would have to be shelved. Throughout World War II and for several years afterwards the land occupied by Temperance Town remained an empty space. 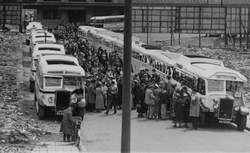 The bus station eventually opened in 1954. Wood Street was widened, and a block of offices known as Terminal Building was erected along its south side. St David’s House, another long block of shops and offices, went up on the north side of Wood Street, and yet another block, Marland House, was built at the eastern end of the bus station. The underground car park, exhibition hall and conference centre were never built, but in 1958 the north west corner of the site was developed for the Empire Pool, used that year for the swimming events at the British Empire and Commonwealth Games. These, and other developments in the Temperance Town area, are described in A New Look for Temperance Town, The Cardiff Spectator, December 1960. Scott Street soon after demolition began, with the end (or possibly the start) of a major excursion.